Welcome to Ballina Info where we strive to provide you with all the information you will need to visit the Ballina Shire. Whether you're planning a holiday or coming to live in the Ballina area, we have all the info you will need and more. Ballina and Lennox Head offer visitors some of the finest accommodation on the North Coast. Your accommodation choices include five-star hotels, apartments, motels, guesthouses, caravan parks and camping grounds. >> See also Lennox Head Accommodation. Enjoy your stay in the Ballina area with a wide range of Things to Do and Natural Attractions to explore. Discover our beautiful beaches, fishing, golf courses, sporting clubs and service clubs. Whale breaching off the coast of Ballina. Check our whale watching page for more info. There is always something to do in and around Ballina, Lennox Head and Alstonville. Go for a stroll along the North Wall, have a swim in Shaws Bay, then check our things to do. The Ballina Business Directory is currently undergoing an update. We will have it back up and running soon. 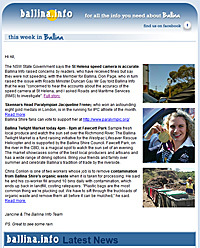 By subscribing to the Ballina Info e-mail newsletter you will receive weekly news about what is on in and around the Ballina Shire. The newsletter will provide you with the latest entertainment news, cinema guide, dining information, real estate news and anything else that is relevant at the time. We may also from time to time send out a special release promoting an event or special offer from a local business. for their chance to win tickets for 2 and take you!